The Thorogood 1892 Wisconsin Collection Portage CXL Roofer Boots, made by Weinbrenner Shoe Company of Merrill, WI. That’s a mouthful of a name for a pair of boots. But, these boots are just as substantial, if not more so, than the name they carry. Here’s the quick hit list on what the 1892 Portage Collection Boot is made from and how it’s made: double layered Horween Chromexcel, triple stitching, Goodyear Leather Welt, and Nitrile Cork Outsoles. These boots are built to last – forever. 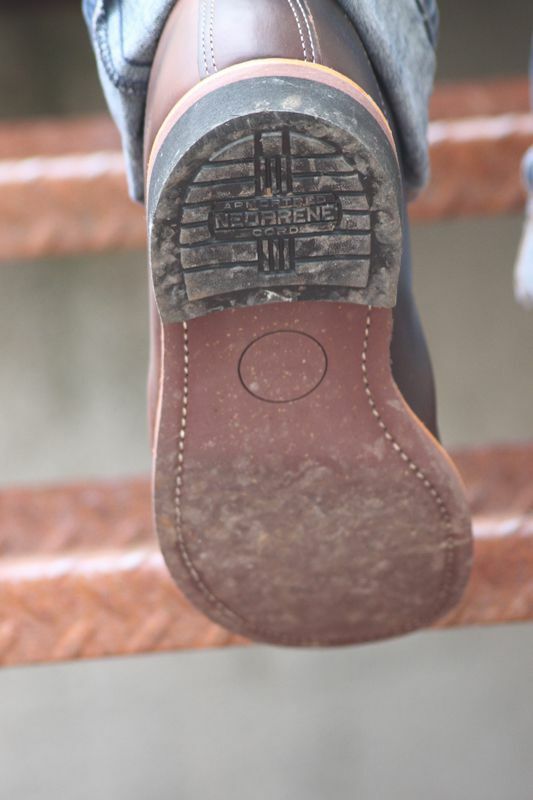 According to Richard Martens, International Sales Manager for Weinbrenner, the original Portage Roofer boots were designed specifically for men who spent their days on roofs. The laces extend forward, closer to the toe than conventional boots. This was to allow more flexibility since roofers were bent over frequently. The side panels of the boots featured a double set of leather reinforcement panels to provide stability while working. These design elements have been carried over into the modern version of the Portage Roofer boots and create an extremely robust, durable boot. Again, in my conversation with Richard from Weinbrenner, I was given a casual, but totally honest, warning that “you’ll earn the right to wear the Portage boot”. He was definitely correct. These boots have two layers of leather and triple stitching – they’re a wee bit stiff when you get them. It takes a little time to break them in properly. Yes, you definitely earn the right to wear the Portage boots every day. I have to admit, there were a couple of points where I was tempted to try an aftermarket insole, thinking maybe a swap would help. However, I pulled the “stock” insole out and it was immediately apparent that the insole was not the issue. It’s deeply padded and features a thick, cushy heel cup. 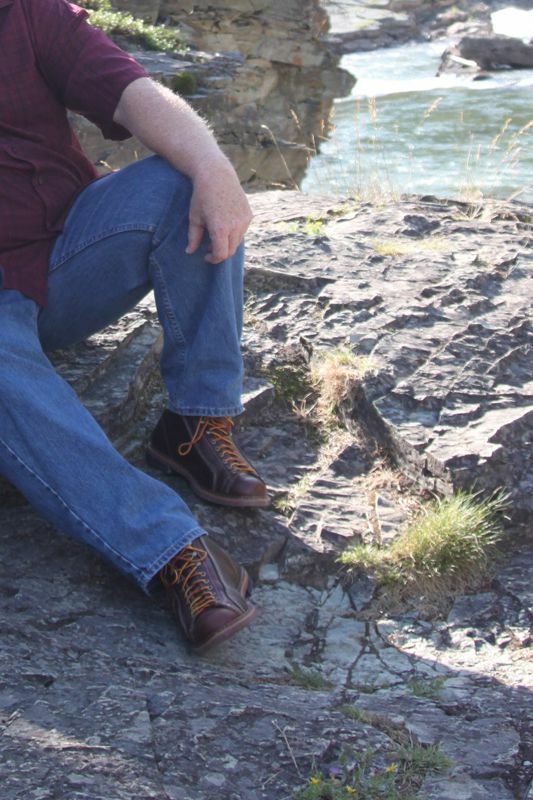 So, I stayed the course…a wedding, a couple of trips to church, an evening out with my bride, and suddenly the boots were “there” – I had them just where I wanted them…comfy and ready for full, daily wear. Once you have the boots loosened up and fitting your feet well, you’re in for a treat. Simply put, this is a very comfortable pair of boots to wear. They slip on and off easily with the 3 lace hooks up top. The sole of the Portage boots is made from Nitrile Cork. These are the first boots I’ve ever had with that type of outsole. Initially, I was a little worried about slippage. However, that is not an issue at all. Nitrile Cork is extremely oil and grease resistant. The sole on the Portage boots features a fine grain and offers superior traction and long term wear. And, once the boot has been broken in, the outsole is very comfortable. Look at the pictures – these boots rock. Their styling is very different from most of the other boots you’ll see out there. 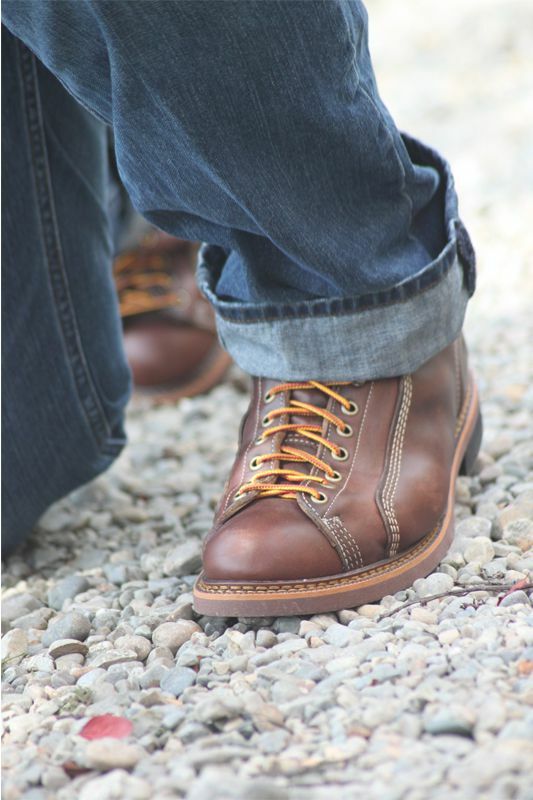 While the original Portage boots may have been designed as “jobber boots”, today they exude style and class. They look good in almost any situation. And, people notice them. I’ve had many occasions where people commented on these boots. The uniqueness of the lace pattern is probably the first thing people notice. Add to that the Horween Chromexcel and the heavy duty, triple stitching and you’ve got a recipe for some seriously stylish boots. The boots on their first full day excursion. Very comfortable! The only thing I’m not completely sold on yet is the laces. Yes, that’s a seriously minor thing to pick on but, I’m just being honest. While I like the color contrast they offer to the brown leather, I wish they too were leather. I may invest in a pair of lighter tan colored leather laces and see if that does the trick. At $305, the Thorogood 1892 Wisconsin Collection Portage CXL Roofer Boots are a serious bargain. Yes, I said bargain. In the realm of quality, leather boots $305 is definitely a deal. They’re made in the USA, sport hefty construction, use Horween leather, and offer excellent style and durability. You can’t go wrong buying a pair or two, or three of these boots. Just remember that break-in period and plan accordingly. 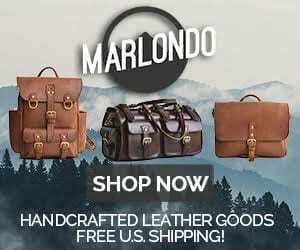 1 Comment on "Thorogood 1892 Wisconsin Collection Portage CXL Roofer Boots Review – $305"